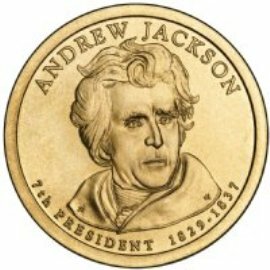 The Andrew Jackson Presidential Dollar marks the seventh in the series. The coins were first released into circulation on August 14, 2008. Jackson served two terms in office from 1829 to 1837. Some fun facts about Jackson are that his portrait appears on the 20 dollar bill. Another is that he was the only president ever to pay off the national debt, and he was also the first president to ride a railroad train. The obverse of this golden dollar shows a portrait of Jackson with his name inscribed above, and "7th PRESIDENT 1829-1837" inscribed below. The reverse of the coin is the same on all issues. It bears a portrait of the Statue of Liberty, and includes the inscriptions “UNITED STATES OF AMERICA,” and “$1” for the denomination.